The Hawthorne Hotel, located in historic Salem, Massachusetts, is a landmark for visitors who want to travel to the historic city. A fine example of Federal architecture, the Hawthorne Hotel caters to guests from all over, both the seen and unseen. Salem is a place which is notorious for the Salem Witch Trials which happened in 1692. Salem is prone to stories of haunting and restless spirits due to the fact that it has a very violent history. The colonial city has more than its share of witchcraft and paranormal activity that go as far back as the infamous witch trials. One of the first women to be executed during the witch trials was Bridget Bishop. She was the owner of an apple orchard where the hotel is now located. Guests at the hotel report smelling apples even though they’re not included in the menu. Most of the buildings surrounding the hotel were constructed by the Salem Sea captains. They were a lively group who assisted people in old age, as well as people with disabilities. However, the Salem Marine Society was razed to give the hotel more space. Other paranormal activities in the hotel have been attributed to the sea captains who were returning to their gathering place. Several hotel guests have reported hearing strange sounds and having strange occurrences. A houseman who used to work in the lower deck returned only to find his entire setup changed and since then has refused to work during night-time. The hotel also has a large wheel in the hotel restaurant which turns around, as if controlled by the hands of a long dead seafarer. 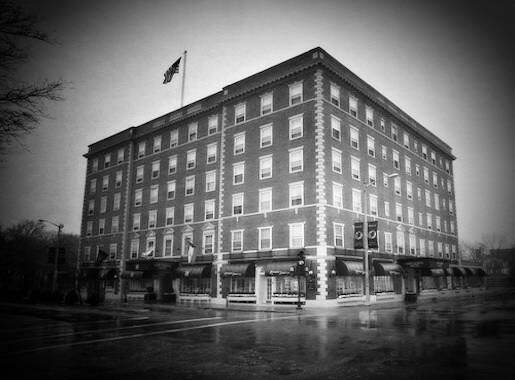 The hotel’s history began in July of 1923 when people in Salem clamoured for a modern hotel. More than a thousand residents of Salem and businessmen bought stocks in the hotel and they owned the hotel until after World War II when a group of local businessmen acquired controlling interest. The hotel opened for business on the 23rd of July 1925 amidst fanfare. Thousands of people turned up for the parade. The hotel was named after Salem’s most famous son, the author of The House of Seven Gables and The Scarlet Letter, Nathaniel Hawthorne. The hotel hosted its first wedding reception in October 1925 and the newlyweds were William Russell Burns and Lucretia Johnson Perkins. Today, there is a time-honored tradition in wherein 100 couples hold their wedding receptions in the hotel. The historic Hawthorne Hotel has 93 rooms which includes 6 suites. All rooms are tastefully furnished and are ideal for families and business travellers. Over the years the hotel has hosted many famous personalities, including actress Bette Davis, President George Bush, First Lady Barbara Bush, Walter Cronkite and Colin Powell. The hotel was home to actress Vanessa Redgrave for a month when she filmed the television show Three Sovereigns for Sarah. The television show Bewitched’s cast and crew of stayed in the hotel while filming episodes. The Tavern is the hotel’s award winning restaurant and its seasonal cuisine offers a wide range of dishes, from eclectic fares to food items from history. The signature dish “Scallops Sophia” should not be missed by guests. Dinner is served nightly from 5 onwards with live piano music on Fridays, Saturdays and Sundays. The restaurant also has an extensive wine menu and desserts. The hotel’s Grand Ballroom is the perfect venue for weddings, meetings and other events. For special occasions, the hotel uses only the most beautiful linens, china and crystals. The gorgeous views outside also adds flair to any occasion celebrated at the Hawthorne Hotel. Salem is a lively place which offers visitors several options for recreation. Count Orlok’s Gallery is a 5-star rated attraction. This is a cinematic museum for horror fans. Cry Innocent in the Old Town Hall is a critically acclaimed re-enactment of the Salem Witch Trials. Frankenstein’s Laboratory is located in the depths of the Salem Wax Museum and it is open daily from June through August. Guests who want to learn more about Salem’s history can go to the New England Pirate Museum. It features a guided tour where guests can visit the recreated dock-side village and pirate chips of New England. It is open daily from 8am to 5pm. The Peabody Essex Museum is one of the nation’s largest museums and it features culture and art not just from New England but from all over the world. Pioneer Village is a three-acre farm of recreated Puritan Village. Guests can also participate in early settlement and colonial activities.